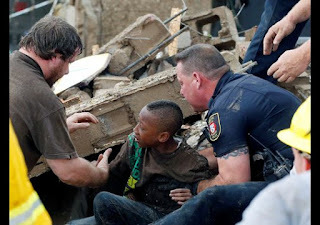 Emergency crews and volunteers continued to work Tuesday morning in a frantic search for survivors of a massive tornado that ripped through parts of Oklahoma City and its suburbs, killing dozens of people and flattening whatever was in its path, including a hospital and at least two schools. Much of the tornado damage was in the suburb of Moore, where rescue workers struggled to make their way through debris-clogged streets and around downed power lines to those who were feared trapped under mountains of rubble. 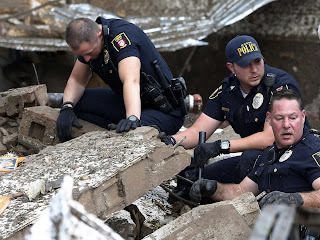 Rescue workers equipped with thermal-imaging equipment and dogs sifted through plywood boards, upended cars and steel beams where houses and shops once stood. As of Tuesday morning, the medical examiner had confirmed 24 deaths, nine of them children, she said. On Monday night, hospitals reported at least 145 people injured, 70 of them children. The risk of tornadoes throughout the region remained high Tuesday, according to the National Oceanic and Atmospheric Administration’s Storm Prediction Center in Norman. President Obama, who declared a federal disaster in five Oklahoma counties, said Tuesday at the White House that the tornado had been “one of the most destructive in history,” and that he had informed aides that “Oklahoma needs to get everything it needs right away.” He said Federal Emergency Management Agency officials had been dispatched to Moore to aid in the recovery effort. Plaza Towers Elementary School in Moore was reduced to a pile of twisted metal and toppled walls. Rescue workers were able to pull several children from the rubble, and on Tuesday, as a chilly rain swept through the area, crews were still struggling to cut through fallen beams and clear debris. At Briarwood Elementary School in Oklahoma City, on the border with Moore, cars were thrown through the facade and the roof was torn off. Shortly before midnight, the area near the Plaza Towers school was eerily quiet and shrouded in darkness from a widespread power outage. Local authorities and F.B.I. agents patrolled the streets, restricting access to the school. Half a mile from the school, the only sounds on Southwest Fourth Street were of barking dogs and tires on wet pavement littered with debris. Hovering in the sky, a helicopter shined a spotlight on the damaged neighborhoods. In the darkness, the century-old Moore Cemetery was a ghostly wreck: women’s clothing and blankets clung to the branches of tilting trees and twisted sheets of metal ripped from nearby buildings or homes were strewn among the graves. Many headstones had been pushed flat to the ground by the wind.